This is my Creative Commons game art thread. Most of the pixel art posted here has a non-commercial Creative Commons license. There are currently two sets licensed under the more permissive CC BY-SA license. The remaining non-commercial assets (CC BY-NC-SA) will remain non-commercial. Most of these sets are incomplete. If there's anything in particular you would like to see added, feel free to make suggestions. Even if I don't have much time to work on these, knowing what you like can help me focus my efforts where it's most appreciated. For older stuff, there's also my Assemblee thread. If you need some help getting started making your own tiles, I've written a short guide with templates. 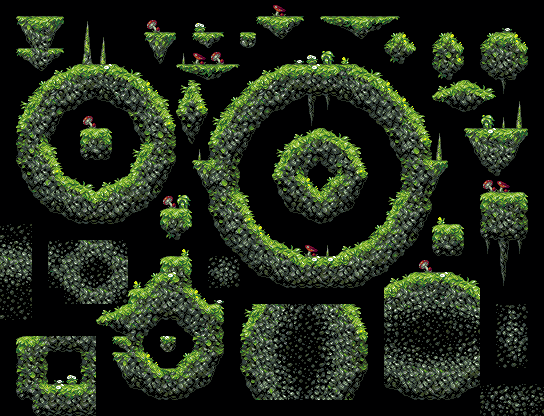 I started working on a fairly minimal 32x32 platformer set for a video series about tiles. 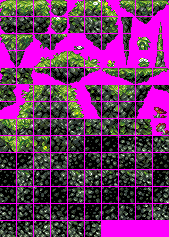 The videos cover the entire process stroke by stroke, so now that I've finished the first stage of the series, I thought it would be helpful to add the tiles here for reference while I work on the next stage. Comparing this with the set below made me realize the forest assets are a bit dim (at least the sunny set, which doesn't quite fit its name). I'll up the contrast on those a bit when I get the time so that the sky from this set can be used with the older set as well. I wanted to make some non-tiling assets for a more natural look, so here's a combination of tiles and trees and other greenery. 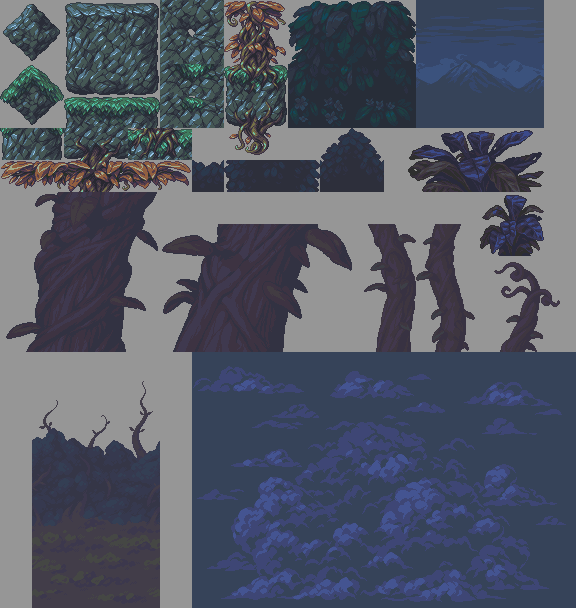 The tree assets work best as background elements, so I'd like to add more detailed foreground assets later, along with more palette variations. 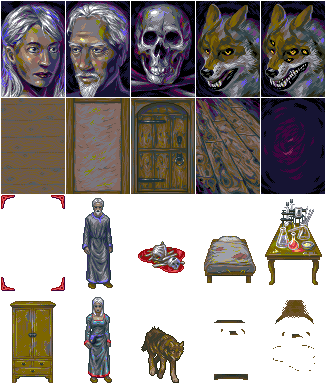 The easiest way to use these assets is to use the base image and modify the palette directly in an editor with decent indexed palette support (such as GrafX2 or Pro Motion). 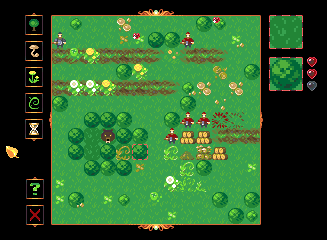 The palette entries are grouped by element (tree leaves, grass, tree trunks, rock, etc). I deliberately chose a simple workflow for the trees so that it would be easier to add more trees in the same style. I also limited the color count so it would take less time to draw them, and separated the colors so that palette swapping would be easier. 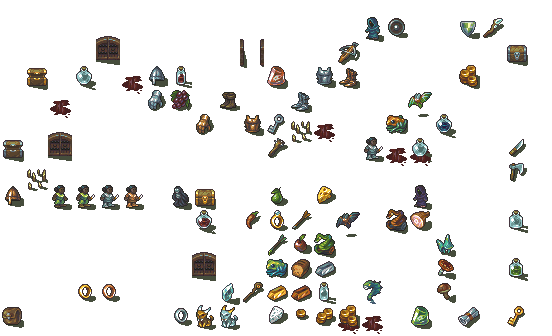 Here are the tree assets. The one shown has the sunny palette applied. 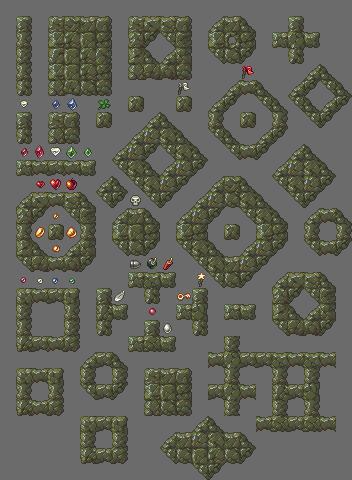 These big rock tiles were meant to be part of the set, but were too large to be practical (96 x 96 pixels). They also use an older palette with a bit more contrast. To clarify, the choice of BY-SA for this set is intentional. A low res roguelike set which uses a fixed 8-color palette. 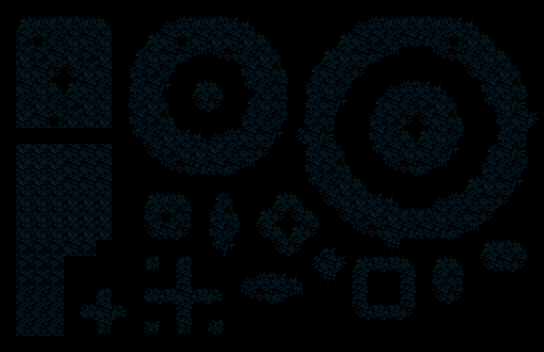 A set of 1-bit roguelike assets derived from the above set. It's compatible with standard character mode on the Commodore 64, so I also added the Char Pad project file I used to test the tiles. The below screenshot shows a static map test running in VICE. 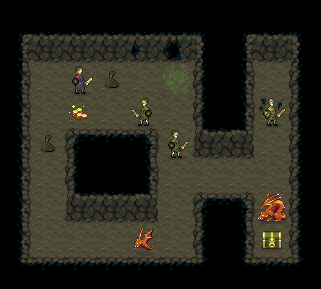 This is a much less color and size restricted set than the 8-color roguelike set. 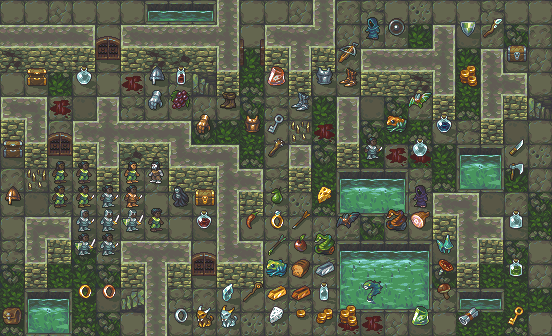 There's still a lot of items and tiles I'd like to add to make it more like the one above, but it takes a lot longer to add to this set. 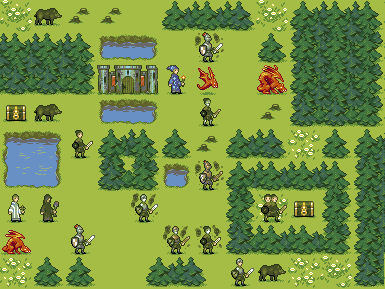 The shadow layer in the mockup uses different colors when on grass tiles and stone tiles. 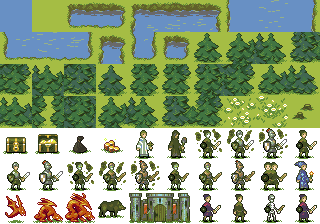 I've made different palettes for the few tiles I have so far to make them a little more versatile. Some assets I made for Echo, a small jam game. 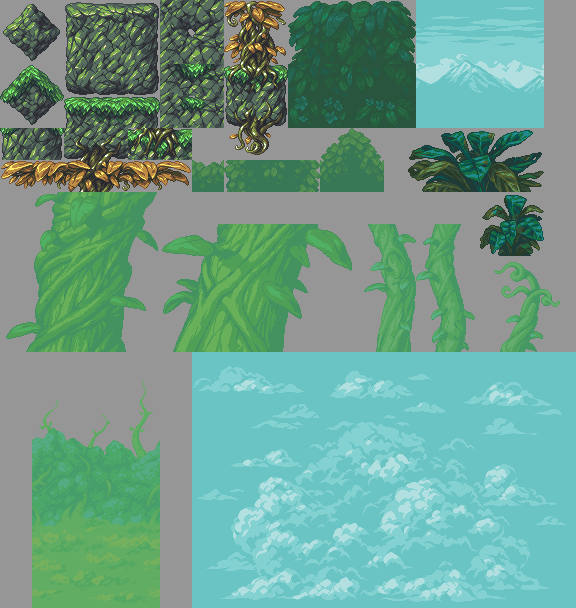 Some tiles I made for practice. Items in the below set are from an old Minecraft texture pack I haven't worked on in ages. Here's a slightly overambitious project I worked on a while back, but since I haven't had time to work on it in years, I'm adding all the assets to this thread so that they'll still be of some use. All the icons are based on real plants and minerals, so if anyone's interested, I can make a list of which minerals/herbs the icons represent. The pixel art I made for Dinothawr is also released under the same license, so I'll add them here as well. The full set of assets (title screen, etc.) can be found in the GitHub repository under dinothawr/assets. 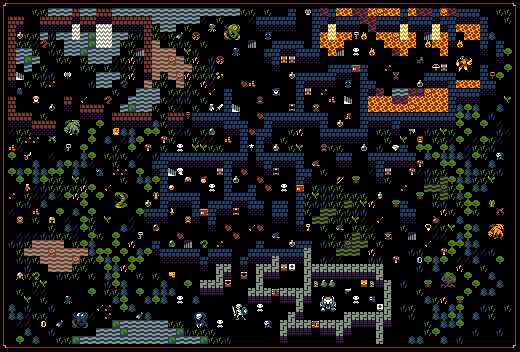 Here are the tiles, sprites and monospace font. 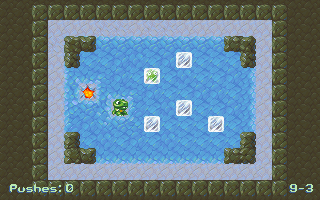 The ice set contains a lot of subtly varying tiles and is a bit difficult to use. The rock tiles were derived from the larger, but simpler, rock set listed further down. 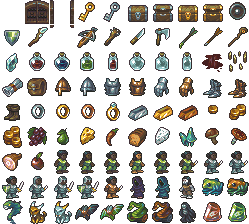 This set is far from complete, but I'm hoping someone can use the sprites, at least. The rock set was a failed attempt, so I don't think I'll be adding any more of those. 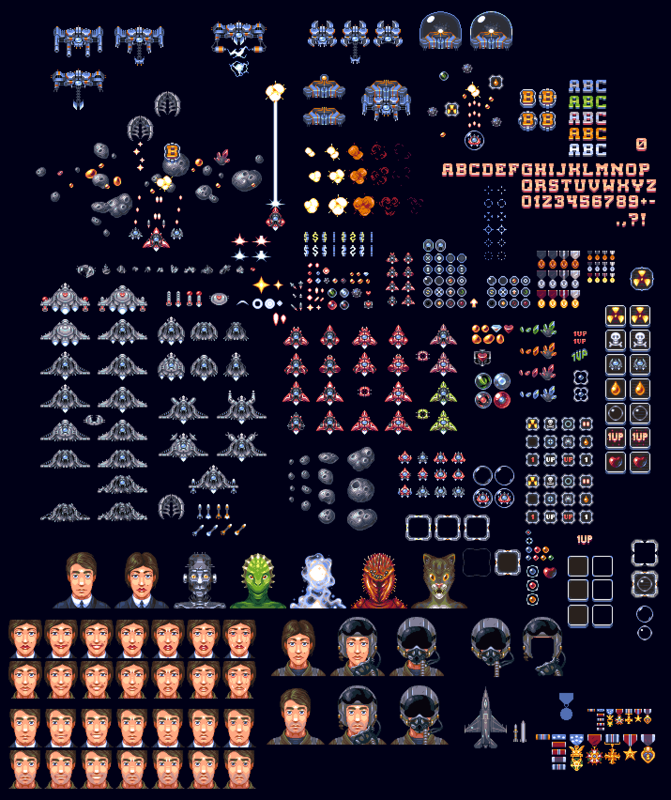 Here's a random collection of sprites and such that might be useful in a shoot-em up of some variety. I don't really know much about that sort of thing, so ptoing gave me a lot of suggestions to make it more useful. I might sort it a little better at some point. 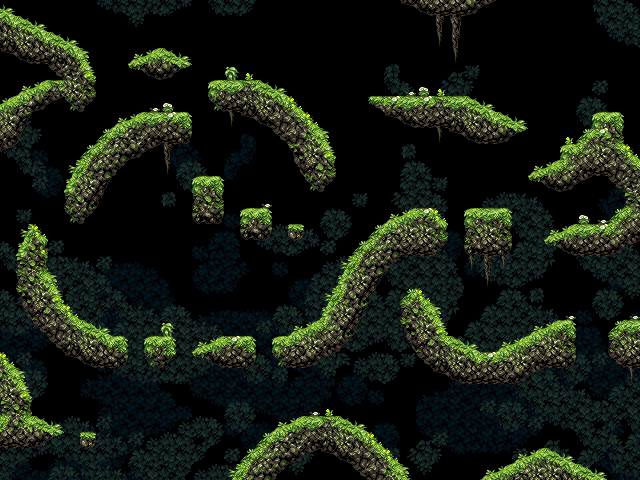 Here I went for a deliberate, semi-tiled look, which turned out to be a bit of a challenge style-wise. I'm hoping this will be easier to add to/modify, both for others and myself. I hope to add some greenery later. I started out with some, but decided to go with plain rocks for now until I find a style of leaves I'm happy with. Edit: I added a simple leaf layer to make the set more interesting, along with a few more things in the power-up set. I also sorted the rock set a little to make it easier to use. 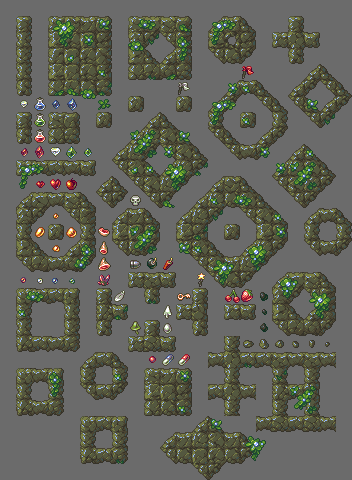 47 tiles in the rock set, 29 in the leaf set and 55 power-ups and other items. I started learning how to use the tile mapping function in Pro Motion 6 in 2009. The initial tileset I made consisted of 110 tiles or so, intended for one of Hempuli's projects. Sadly, he couldn't use it, so I ended up adding some more tiles to it, polished it a bit more (with lots of help from ptoing), and now I'm releasing it under a creative commons license. 136 tiles in the rock/grass set and 49 in the leaf set, plus another 28 tiles. I'm clueless about a way to arrange the tileset but let me tell you that the whole thing is gorgeous, thank you for releasing it. That is beautiful! Thank you so much, this will be a huge boon for game makers. Yes! I'm so sad that my own pixeling skills didn't match the glory of this one, and I think it's great that you put it into good use. Wow, this is magnificent! Thank you so much! Er.....what does creative license common means? Btw, love those. I always had problems with bush and grasses. Any tips? Really nice set, I might use these some time if I feel lazy. Have you considered posting this on http://opengameart.org? Hey, I didn't mean to let this thread die, I've just been super busy lately. Anyway, really glad to hear you like it. 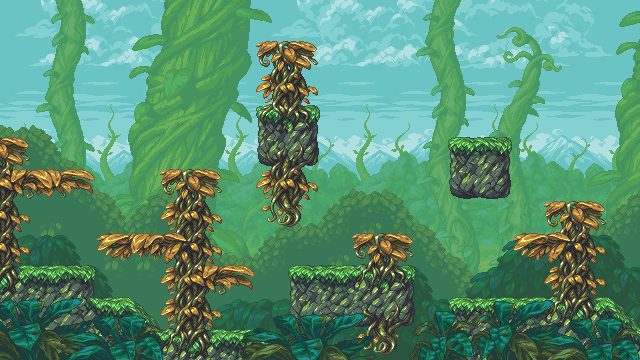 I realized I had forgotten to add ladder tiles, so I drew some vines and also some random power-up items. I always had problems with bush and grasses. Any tips? I find photo reference helpful or even going outside and sketching stuff in the wild. Yeah, I thought about that, but they don't have any non-commercial licenses as far as I can see. I think it would be nice if the playing field was a little more level for freeware game developers, so I prefer using a non-commercial license. I'll definitely have to think of a place to put my stuff if I find the time to make more sets. When or if I do, I think I'll make several simpler sets instead of one large, for more ease of use and variation. I think they intentionally avoid the non-commercial licenses, so you won't have much luck there if that's what you want. It doesn't jive with their desire for complete openness. What sort of credit do you want if I use these?